Units have two Gentle Spray outlet heads. Provides soft, wide stream of water to quickly and gently rinse away contaminants. Heavy duty ½" IPS chrome plated brass stay-open ball value. Tough corrosion resistant body assures durability and long life. Safety green emergency eye wash sign is included with each unit. WaterSaver safety orange ABS plastic shower head is standard. Large sized aluminum pull rod is easily located and grasped in an emergency. Components are corrosion resistant. Rugged 1" IPS chrome plated brass ball valve. Made in USA. 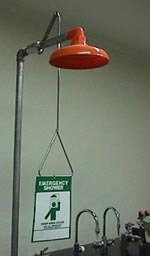 Safety green emergency shower sign is included with each unit.